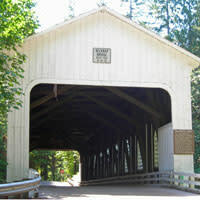 The Belknap Covered Bridge, sometimes called the "McKenzie River Bridge," has persisted through several generations of bridges at the same location. The nearby town of McKenzie Bridge was named by it&apos;s proximity to the bridge. 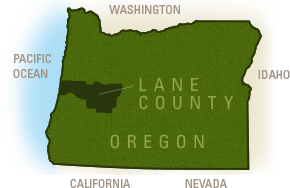 The site&apos;s current bridge is the most recently built historic covered bridge in Lane County. (Lowell&apos;s and Cottage Grove&apos;s pedestrian covered bridges are the newest structures.) 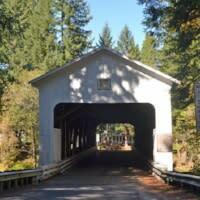 It is also the furthest east of all of Oregon&apos;s covered bridges. Current Access - Vehicles up to 11 tons, maximum height 13&apos;1"
Rollin S. Belknap, an early pioneer settler, discovered hot springs approximately nine miles (14 km) upstream from the bridge. His family was influential in developing the area, and the bridge took on the family name. After a flood washed away the third bridge in 1964, the current Belknap Covered Bridge was built. It was originally designed by OBEC to accommodate the weight of logging trucks up to 35 tons. Today, however; there are weight restrictions in place to protect the bridge. In 1975, louvered arch windows were added to the south side to increase interior light. From the windows watch paddlers shoot the rapids and anglers in McKenzie River Drift Boats pass under the bridge. In 1992, structural and exterior repairs were made, including the installation of additional windows on both sides of the bridge. In 2002, the roof was replaced.